Bewitched 1945 Lobby Card. 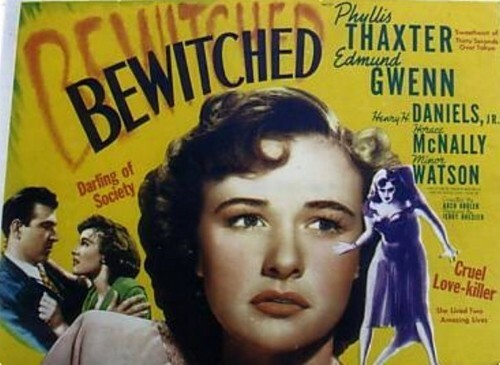 Original 1945 lobby card for the 1945 dark movie Bewitched which starred Phyllis Thaxter.. Wallpaper and background images in the فلمیں club tagged: bewitched film noir phyllis thaxter movies lobby card. this is going to make you feel old my dear, so sorry but what's a lobby card? Oh dude, gimme a break, lol! Ok, a lobby card is simply a cinema poster. Usually lobby cards were made of stronger material, eg: cardboard or just much heavier paper than ordinary posters. The first lobby cards manufactered were actually just 8x10 photo stills but in time they were the size as the posters you'd now be familiar with. Hell, don't they make lobby cards anymore? I must protest to this! No, I bought it on Ebay last year. Of course, I know you were *whispers* I so don't believe her!